Many will be aware that, for a long time, Moot has hosted essays on our site unter the section called Greyspace. As we are updating the site, (and I have spent the afternoon transferring 29 essays onto the new site, trying to not get engrossed in each one!) I thought it may be a good oportunity to expend this resource. All essays will be read first. Essays will not neccessarily be posted online. Whether essays are posted is left to the discretion of Moot. A friend of mine recently pointed me towards a blog on the BBC’s website written by a woman who decided to give up plastic for a month. My initial thought was: Why? It seems a bit extreme. What’s so bad about plastic? OK, so the creation of plastics relies heavily on the oil industry, but provided we don’t over-rely on it, and recycle regularly, what’s the issue? 1) Apparently there are about 9 “gyres” or currents circling the world’s oceans. In one of the blog entries, she highlights the cross-Pacific journey made by Dr Marcus Eriksen and film-maker Joel Paschal in a boat made from junk. The photo you see above is of the plastic “soup” that fills these gyres, and all the gyres are thought to be in a similar condition. These plastics are reckoned to have been through marine life about 9 times now, and are pretty much part of the food chain. I did see a web page with an example of a fish cut open, with 14 pieces of undigested plastic in its stomach, and a whole report on it. Unfortunately I can’t find the link. 2) The amount of things that are made from plastic now and don’t need to be are insane. Those facial scrubs that have tiny stones in them? Many of them have replaced the stones with plastic beads. Plastic is used to contain just about everything, where paper and card used to do just fine. Years ago, strawberries (for example) used to be a luxury, and came packed in card punnets. Now for two weeks every year, the country is awash with strawberries, all packed into plastic punnets. That’s just two examples, there are many others I could point to, but don’t have the space here. 3) Plastics leech into our food, especially from what’s known as BPA. I’m no chemist, but apparently under certain conditions, plastic will leech toxic chemicals into foods as it breaks down, especially fatty food (remember the scare about wrapping cheese in clingfilm a few years ago?) Plastic bottles of mineral water are designed for SINGLE USE only, so re-using them to carry water is not great. About the best thing, if you want to take water with you, is a stainless steel canteen favoured by campers. I honestly don’t know how to deal with this one. A part of of me thinks you can’t avoid plastics altogether, although my current favourite plastic-less blogger, Fake Plastic Fish, seems to do just that pretty well. But at another level, I recognise that the current level of plastic usage is unsustainable, and something needs to be done urgently, as current re-cycling methods are clearly not enough to stop plastic getting into the food chain. I’d like you to watch the above video. It’s important. Not because I agree with it, but because it represents something. It seems that in the light of the past few years’ worth of military and political activity in Iraq, Afghanistan and so on, for some spirituality has become something to “tackle” as harmless nonsense, and religion as organised dangerous nonsense. I know most readers of this blog would make the distinction between religious and spirituality, but for many people that I come across, they are considered to be two sides of the same coin. Please Note: None of the examples are intended to show any of the points of view presented are wrong, or belittle any religious or political belief. Please concentrate on the structure of the argument rather than the subject matter. I could just have easily have presented a false argument from the opposite position. Where you attack the speaker and not what he’s saying. If someone has to resort to this technique, you’ll often find they haven’t thought through their position very well. This form of argument goes on all the time in political circles. This is also known as an “appeal to authority” and is very common. Just because a statement supposedly comes from a credible source, doesn’t mean it’s true. Most of us rely on this one more often than we probably should. We’re unlikely to investigate too thoroughly whether what a doctor says about our health is true, for example. He’s a doctor, so we just assume he’s right. Because this is such a powerful form of poor argument, it’s often used to trick people into believing something that may be false. Advertisers use scientific terms to sell their products, for example. You can usually spot someone who’s using this to cover up a weak position by pushing them to provide some evidence other than the authority to back up their claims. This is when you say an assumption works in both directions, even if there’s no reason to believe so. Just because X means Y, doesn’t mean Y means X, in other words. This can be a very subtle argument to catch out. This is a very common form of poor argument. It involves misrepresenting your opponent’s position, by pretending it’s something that sounds similar but is easy to refute. This is used a lot in political or religious arguments. Example: “The only reason you want to stop companies offshoring jobs to India is because you’re a racist. No decent person can take such an argument seriously”. This is the appeal to the majority argument. If enough people believe something to be true, then it must be, in other words. The problem is, history is full of examples of sincere majority beliefs eventually being proven false. Just because a lot of people think something, doesn’t make it right. This is an easy one to catch people out with. Just because two things happen at the same time or in the same place, doesn’t mean there’s any kind of cause and effect going on. It may just be coincidence. Example: “Every time Frank is on duty in the store something goes missing. That guy must be a thief”. This is a type of circular argument. Basically, it takes the form of putting the proof of your argument into one of the assumptions. The conclusion appears at the beginning and the end of the argument, so nothing of any substance is really created. It basically says X is true, because X is true. It can also take the form X is true because Y is true, and Y is true because X is true. Example: “Only a loving God could have created such a wonderful world, therefore our world was created by a loving God”. I have quoted this almost precisely from a great website called Paul’s Tips, and I’m very grateful to that website for such a concise rendering. Please go and check out the many other brilliant things there. Not sure if everyone has seen this yet, but Gareth Powell gave the heads up on Fon. If you have wifi, Fon enables you to make it available securely to others in your neighbourhood, and then to be able to use other peoples wifi in other places all around the world. I like this idea of sharing in a form of global co-operative. Not only does it share resources generously with others, but it also will save you money if you need access to wifi abroad. For some providers – you can subscribe to this and make some money back by charging for people’s use. This seems quite stingy to me. If you have a BT broadband service, then you can register through them for Fon, and then people can access your wifi through BT Openzone with no exposure to your wifi settings or security…. I am going to the States and Canada in June, so we will see if it works, I am hoping so…. Those of you who know me will have heard me raving about the book “Affluenza” by Oliver James a lot lately. Affluenza is about how deeply contemporary life in the English speaking world revolves around the notion of what James calls “Selfish Capitalism” – an economic system that is geared towards unhealthy attitudes to money, status and influence, and that affects how we see each other and how we see ourselves. The problem, as James brilliantly defines it, is that the impact on us as human beings is immense in terms of emotional distress – addiction, depression and anxiety. It affects how we live, how we think about life, how we think about each other, how we divide up our time, what we do with our money, how we raise our kids, our education system, what and when we buy property, etc., etc., He cleverly and incisively shows the reader how the values that we have adopted without thinking are often dictated by these things more than anyone else. Looking at it as a phenomena that particularly affects the English speaking world, he interviews various people from England, USA, Australia and New Zealand, whilst also interviewing people from different backgrounds to compare and contrast non-English speaking nations that have caught the “Affluenza bug” (Singapore), nations that are well on their way to catching it (Russia and China), and nations that don’t appear to have it at all (Denmark). I think this is very relevant for us as a community as a topic for discussion (and not just because it would appear statistically that a belief in God is a good way to cope with our overly Selfish Capitalist society). Whilst I would disagree with James on many things, I believe the book would be an extremely useful diagnostic tool, in helping us to live out the idea of Balance, as expressed in our Rhythm of Life, as well as identifying possible coping mechanisms for depression, addiction and anxiety. This is something that I have observed us as a community (myself in particular) struggling with, and to that end we will be taking Affluenza as a theme for a month in the new term’s programme. Also, in order to spark discussion I will blog again about this subject, making it a regular series here. If you want to get ahead and follow me, especially as we are going to make the book into a theme as part of our regular meetings, then get a copy through the link to the right of this page (scroll down, just below “Friends of Moot” section – buying it through us helps moot because a proportion of the cost goes to help fund moot’s work. 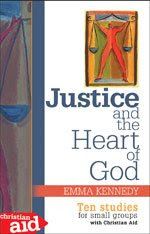 The new book by Emma Kennedy, Justice and the Heart of God (Lion Hudson), can be pre-ordered from the link above. It looks like a great resource for small groups or mini-moots, having a series of ten well researched studies addressing issues of great significance in contemporary society, such justice, climate change, gender, debt, refugee’s, aid and trade. Did I mention that Emma is my sister?! We are now in the Second Week of Advent, looking forward towards the miracle of the birth of Christ. Loved this. Really touched my heart.